There’s no evidence to suggest that Theodore Roosevelt was discussing the freight bidding process when he uttered those words, but he might as well have been. When transportation industry professionals – particularly those employed by for-hire carriers, brokers and 3PLs – hear the words “effort,” “pain” and “difficulty,” chances are they’re immediately reminded of bid season. And for good reason. As summer turns to fall and shippers intensify their freight procurement activities, transportation providers are inundated with RFPs covering hundreds, and potentially thousands, of lanes. These RFPs have very little in common, with the exception that they are becoming increasingly complex as shippers identify and implement best practices aimed at optimizing transportation networks, eliminating surprises and reducing freight spend. What does this mean to the recipients of these RFPs? Potentially hundreds of hours of work, no shortage of sleepless nights, and the risk that they will either leave a lot of money on the table or price themselves out of a valued business relationship. In short, bid season is fraught not only with stress, but also significant financial risk. How can you handle the “heavy lifting” of freight bidding season while minimizing this risk, enhancing your ability to win new business and – most important – making sure that business translates to a stronger bottom line? 1. Understand current market rates. You can be certain that shippers are employing advanced technology, including the latest pricing intelligence, to structure RFPs and finalize freight agreements. It’s incumbent on the transportation provider, therefore, to approach every opportunity with cold, hard facts, including current and historical costs. If this sounds complex, it is, unless you are using the right tools, including extensive pricing intelligence by lane in conjunction with a comprehensive freight bidding software solution. 2. Know your competitors’ pricing strategies. How well do you know the carriers, brokers and others who are likely bidding against you on each opportunity? You can be sure they are trying to learn as much about you as possible. Competitive research is a year-round process that becomes invaluable in the fall when a majority of RFPs appear in your email inbox or on your desk. 3. Develop and deploy a consistent bid strategy. Before you can find, pursue and win the right new business, you need to understand which opportunities are indeed best for your fleet. This demands open dialogue and clear understanding among every team member with input to the process. In which lanes are you underperforming, and why? What lessons have you learned from past rounds? What successes can you build upon in the current bid season? 4. Leverage a freight bidding solution that maximizes your advantage. Imagine a web-based app that handles all of the heavy lifting associated with bid management, saving you time and effort while providing critical pricing intelligence and other information needed to maximize wins and revenue. That solution now exists – the new TMW Engage.Bid web application enables carriers, brokers and 3PLs to streamline each phase of the freight bidding process. Designed by industry experts with years of experience in bid management and pricing, Engage.Bid simplifies the conversion and analysis of often-complicated shipper RFP documents. Users can then apply critical pricing intelligence – including the TMW Market Rate Index (MRI) – to more quickly assess each opportunity and develop bids based on pricing derived in a uniform manner and in the context of historical and market rates, lane by lane. TMW’s bid management platform also tracks the status of open bids and indexes and stores current and historical bid data in searchable form. This helps users complete more bids, more accurately and competitively, in less time. Freight bidding season is a time of tremendous opportunity for many transportation providers. As with many opportunities, however, it also is rapidly being transformed through the application of new technologies. Shippers are investing in solutions to try tip the balance in their favor. Carriers, brokers and 3PLs can and should do the same – and there are now proven trucking software solutions available to help master this vital process. 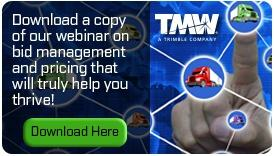 To learn more freight bidding best practices, call TMW at (440) 721-2806 or visit tmwsystems.com/engagebid-request-demo to request a free demo of our bid management platform.